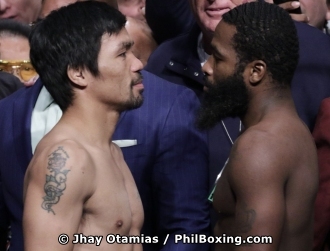 LAS VEGAS -- Tomorrow's big fight is a go as Filipino boxing legend and eight division world champion Manny Pacquiao and four division world champion Adrien Broner made weight at the MGM Grand Garden Arena Friday afternoon in front of a jampacked and raucous crowd. Pacquiao (60-7-2, 39KOs) who will defend his WBA world welterweight crown, came in at 146 lbs while his challenger Adrien Broner (33-3-1, 24KOs) stepped the scales at 146.5 lbs. The referee of the fight is Russell Mora while the judges are Tim Cheatham, Dave Moretti and Glen Feldman. 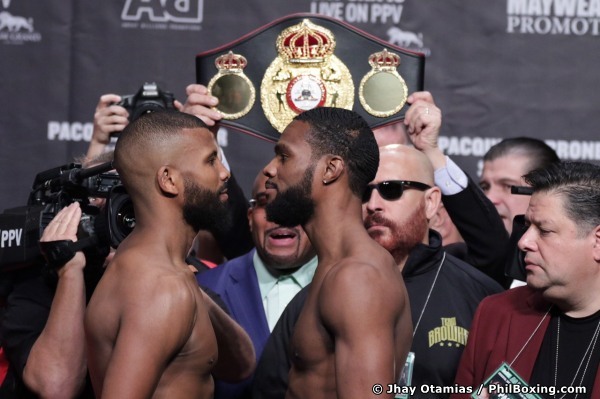 In the co-feature for the WBA Interim & WBC Silver Light Heavyweight championship, 12 rounds, Badou Jack (22-1-3 13KOs) of Stockholm, Sweden weighed and his opponent Marcus Browne of Staten Island, New York both came in at 175 lbs. 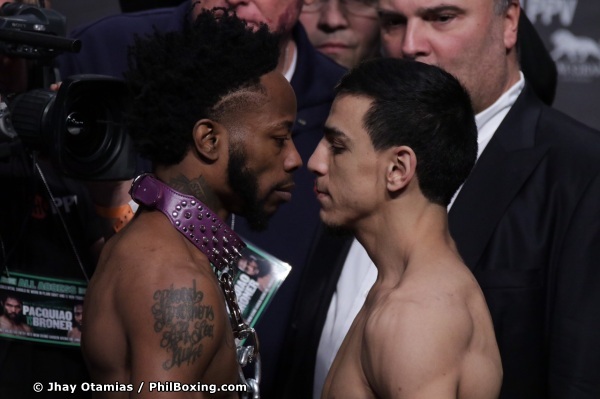 For the WBC world Bantamweight championship, 12 rounds, defending champion Rau'shee Warren (12-2, 4KOs) of Cincinnati, Ohio scaled in at 116.5 lbs while his challenger Nordine Oubaali (14-0 11KOs) of France weighed in at 118 lbs. Meanwhile Jhack Tepora failed to make weight as he came in 5.5 pound overweight at 131.5 pounds. His opponent Hugo Ruiz stepped the scales at a comfortable 125 lbs. Reports had it the fight has been canceled... developing story.